Like most recipes, the origins of the dish are obscure, and there are several stories of how it came to be. As the name is derived from carbonaro (the Italian word for charcoal burner), some believe that the dish was first made as a hearty meal for Italian charcoal workers that was fixed for them to eat when they came home from a hard day of work. This then led to the the name "coal miner's spaghetti", which is used to refer to spaghetti alla carbonara in parts of the United States. It has even been suggested that it was created by, or as a tribute to, the Carbonari ("charcoalmen"), a secret society prominent in the unification of Italy. 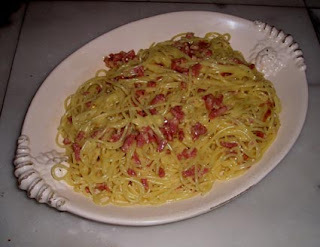 The dish is not present in Ada Boni's 1927 classic La Cucina Romana, and is unrecorded before the Second World War. It was first recorded after the war as a Roman dish, when many Italians were eating eggs and bacon supplied by troops from the United States. More recently, a restaurant in Rimini has claimed the original recipe was born during WWII. Powdered eggs and milk, along with bacon, were standard issue for the American troops and were widely used for bartering with the population. Italians would use those ingredients and pepper to make the sauce. The dish became popular among American troops stationed in Italy; upon their return home, they popularized it in North America. The recipe was included in Elizabeth David’s 1954 cookbook published in Great Britain. This is a family favorite. Thank you for visiting me for Pink Saturday! I am soooo sorry I haven't commented back till now, blogger hasn't let me comment!!! mmm...one of my faves - thanks for the recipe! Also, thanks for stopping by! Come back if you have the time!